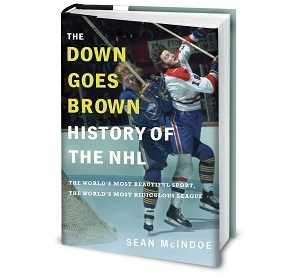 Sean -- Reading your terrific columns, as I always do, I notice you commenting frequently on "hockey traditionalists" versus, perhaps, the rest of us. Plus you are interested in trends over time. I have thought for a long time that hockey is shaped by the fact that hockey players are harder to identify on the field of play than in any other sport -- they wear full cover-up uniforms, helmets with visors which they never take off, readable numbers only on the back, change ever 45 seconds, are constantly changing position, and so on. I think this means that being a fan of hockey requires real dedication, since fandom is based on identifying with players. Hence, hockey is more of an "fan insiders" game than others. This may be good or bad, and could easily be changed if desired, so it occurs to me you might agree that its an interesting question. I wrote a long memo about this around the time a friend of mine was being interviewed to be Commissioner -- he lost out to Bettman, sadly -- and would love to send it to you. Drop me an email at cda[at]cdavidanderson.com and I will attach the old memo to the reply. Or should I say, terrible article. I guess I was one of the clapping seals that believed the NHL when it said it was going to provide 'noticeable' differences with the goalie equipment for next season. I keep getting sucked in to believing that we may get back to an era where a goal can be scored from more than 4-feet outside the crease without a screen or deflection occurring.